Hours ahead of its official launch, images of Samsung's new foldable phone have apparently leaked online. 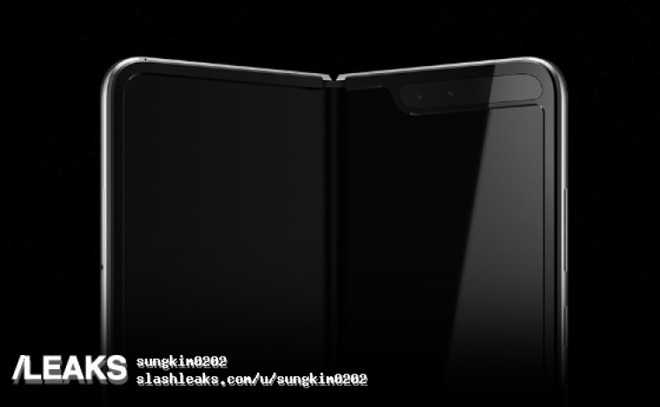 Alongside the name "Galaxy Fold", the images also reveal a large notch for what is presumed to be the forward-facing camera. While claimed to be renders rather than photographs, the images look as if they may be part of Samsung's Galaxy Unpacked presentation, scheduled for Wednesday. Galaxy Unpacked is expected to showcase the Samsung Galaxy S10, but supply chain rumors have said and the company's own promotions have heavily hinted that there will also be a foldable phone. A version of this foldable phone was previously shown as a proof-of-concept by Samsung in November 2018. During that demonstration, the phone was reported to be 7.3 inches in size when unfolded. Samsung claimed then that up to three apps can be used on the larger, unfolded display at the same time. The new presentation is officially the launch of the Samsung Galaxy S10 and will take place at 11:00 a.m. Pacific Time , 2:00 p.m. Eastern Time on Wednesday. It will be streamed live on Samsung's official site from the Bill Graham Civic Auditorium in San Francisco, California. While Samsung was the first of the major phone makers to demonstrate a foldable phone prototype, others are believed to be working on the same idea. That includes Apple which back in 2017 was rumored to be working with LG on a foldable iPhone for release around 2020. 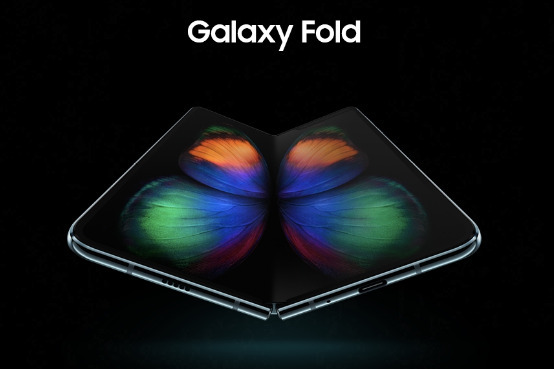 The leaked images of the Galaxy Fold were first uncovered by SlashLeaks. It seems to confirm there will two screens placed very close together on a spine. I'm not sure if the cutout appeals to me or not. Looks like a decent first effort but everything will hinge on price. Looks nice. But it still runs on Android. Major issue. I guess the Taco Phone name was already taken? It's hard to tell from the picture - is it two separate displays? Or is it just split at the bezel and the display itself is one continuous screen? Either way, with the price, the thickness, and everything else, it'll be a niche product the way the Edge was when it was first released. Third gen might start to get interesting. They'd do better to focus on the S10, which looks like it'll be a very nice phone. Thin bezels at the top, no side bezels at all and personally, I slightly prefer the cut out to the notch. Then again, are the top/bottom bezels thicker than on an iPhone? Either way, it's great to see Samsung competing at the high end with Apple. Guess you can close the door on any bendgate issues. Would love to be able to peak inside the doors of Sir Jonyy Ives studio to see what is unfolding with their foldable phone prototype. Wonder if Face ID will be needed to unlock and open the phone up. I might actually give this a go. If the screen down the middle isn’t split too bad. They have my interest. Really unclear to me what problem this solves? There are quite a few positives here. More screen in a smaller footprint. Screen protected by itself when folded. In today's ad based revenue world and advertisers working against ad blockers, a future OS feature that could shift ads and notifications off the main screen would be nice. Split screen use would improve. Not going be cheap like that of the current iPhone XR is. Apple will be buying 20 of then to give to their engineers and one to Tim Cook to study and use. Look for Apple to be releasing their own version in 2022! I still predict this to be a massive failure. Thai is why LG said they will not release this, because the idea is immature. What is the point of having that large screen in the device that should be held in one hand? Unless big screen unfolding is optional this does not seem like the greatest idea. Well, yes, that’s a given. But the tech media will fall all over themselves heaping praise and adulation, proclaiming it to be a great leap forward in innovation. Then it will fail in the marketplace (like Google Glass) and slowly fade away without a trace. The tech media will quietly sweep it under the rug and go on to the next knight in shining armor that will “revolutionize” a saturated and commoditized market. A foldable iPhone. So innovative! Love how the bottom completely rips off Apple. No headphone jack? "They want us to be there at midnight!! For the S10 and S10 Plus. Who the hell wants to be up late for this phone? Everyone already has the Ex Ess and the Ex Ess Max. I didn't even know about this damn phone until last night!!"